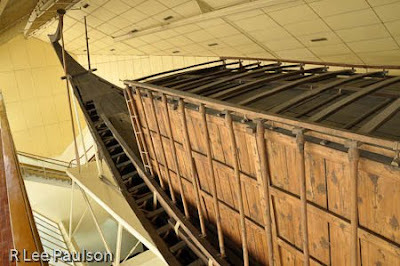 This amazing boat was found buried next to the great pyramid. It was buried in a deep trench covered with limestone blocks. It had been completely disassembled before burial in order to make it fit into the narrow trench. As was typical of the ancient Egyptians, they neglected to include an assembly manual in with the pieces. I'm told it took a dedicated team of specialists ten years to figure out how the boat went together and to reconstruct it. I have say they have done a beautiful job of reconstruction. 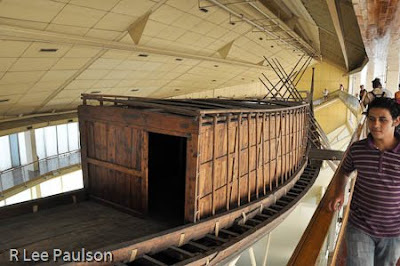 The boat is on display near where it was found next to the great pyramid, in this specially constructed building that has a display showing the reconstruction on the bottom floor and the boat above. Unfortunately, the space was too small for me to show the entire boat in one frame. Notice the first oar on the right. Now look down a bit and you will see the rope which holds the entire structure together. There isn't a piece of iron used anywhere. Rope was a brilliant choice for holding the ship together. When wet, the wood planks swell and the rope shrinks, making the ship water tight. In addition, the rope allows the ship pieces to move in heavy seas. You can see more of the rope construction here. 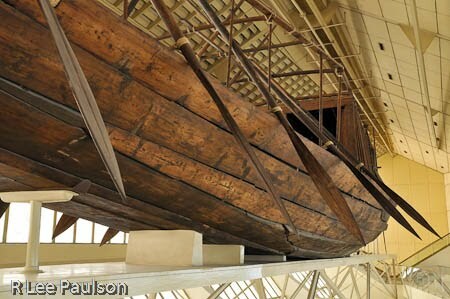 John West has had boat builders on his trips and when they saw this, they said it was light years ahead of the ships Columbus used. In fact, all three of his ships would fit on the deck of this one. 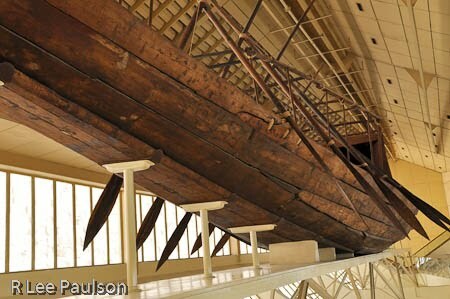 The Egyptologists claim that this ship was used for ceremonial purposes only, that the oars were purely ceremonial. However, West has also had crew rowers on his trips. They say that the oars weren't purely ceremonial at all. If the cabin, which was built later than the hull, were taken off, not only would the ship would have room for a mast, but rowers also. Indeed, those who have crewed in races say that the oar design is very sophisticated and that ten rowers placed properly could make decent headway in this ship without all that much effort. Notice the deck has compartments that can be removed. When removed, the space created allows room for the rowers. Here's a shot from the bow looking back, framed by my lens hood. 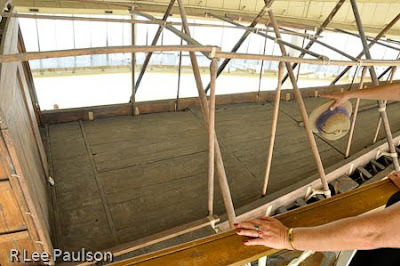 The boat builders who have been on John West's trips say this ship is not only seaworthy, but is capable of going anywhere in the world. This is a shot looking back toward the stern. Notice the shape of the poles holding up the cabin. One of the things that West likes so much about the ancient Egyptians is that they blended their myths with reality. In ancient myths, the pharaoh becomes immortal by sailing in a ship across the night sky. West contends the symbolism connotes that every man (and woman) is a pharaoh who is destined for immortality. 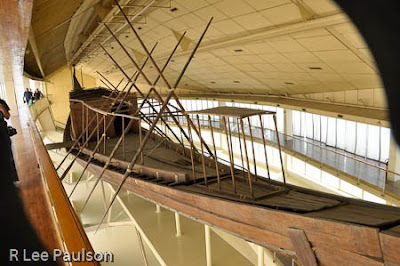 While this ship may have been used to carry a dead pharaoh up the Nile to Luxor (Thebes in the old days) for burial, it had also clearly been used previously for ocean going voyages. West knows this because yet another boating enthusiast on one of his trips pointed out a scuff on hull, which the man said could only come from contact with a coral reef. Notice also in the back, there is no rudder as such. Instead there are two oars. 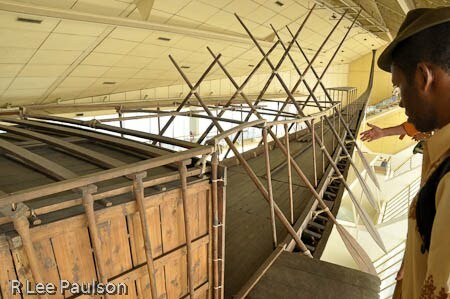 According to the academics, only one piece of wood was warped when they pulled the pieces out of the pit. That piece was one of the stern oars. However, yet another crew person on one of John's trips saw the "warped" oar and reported that he had seen just such an oar used on the stern of a boat, and that when one knows what one is doing, one can use it to spin the tail of the boat around in tight spaces just "as easy as pie." Interesting what one learns when one consults experts in fields other than archeology. Bottom line from all this evidence we have seen is that the ancients were very grounded in the use of symbolism and, as West says, "anchoring the spiritual quest in the material/physical world." He suggested that we always look past the obvious depictions that have been created by the ancients and interpret what we see through the eyes of a "symbolist." One thing is certain, the ancients did nothing without a reason. We may not know what the reasons were, but nothing was done just "by chance" or "by accident" or because "they changed their minds" or "because "they ran out of money and couldn't finish." Again and again I kept running up against evidence showing just how remarkably sophisticated the ancients were. Primitives? Hardly. Not with a design like this. We were worn out--and it was only the end of our first day. Well, not quite the end of our first day. We retired to John West's favorite fish restaurant for a late lunch, the one across the street from the Mina House where I snapped the night time shots of the light show. It had been a hot, dusty day and we were all looking forward to a cold one with our meal--even me and I'm not usually so inclined. However, to John's and the rest of our chagrin, the owner of the restaurant had recently found religion and no they longer served beer. 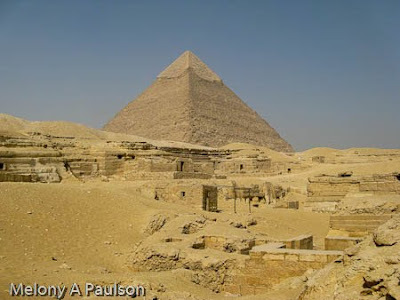 Continue on to Post 8: Sakkara by clicking here. Wonderful post and great pictures. I think it is a wonderful proof of Ancient Egypt's advancement. 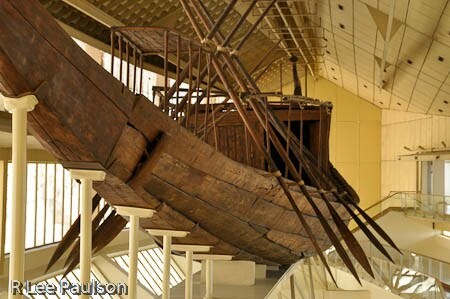 What do you think the equivalent of such a ship would be today? considering the time it was built in and the "technology" it used?